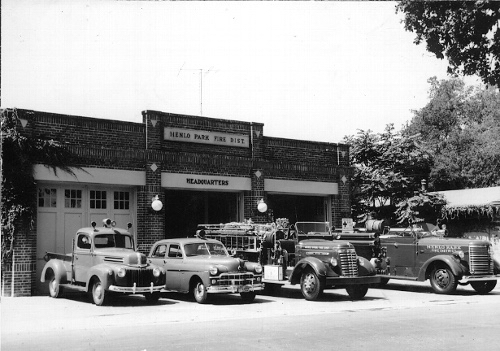 The Menlo Park Fire District’s first Fire Station was built in 1919 and paid for by the War Department that supported Camp Fremont, which was training Army soldiers for World War I. At one point the Camp supported 28,000 soldiers, thousands of horses and mules, and 1,125 mostly temporary (flammable), wood buildings. A fire at the Camp Hospital and impacts to the Southern Pacific Railroad and Bear Gulch Water Company along with businesses like saloons, casinos, and theaters that rushed to build venues for the soldiers to enjoy — and the owners to profit from — overwhelmed the quiet little 2,000-person “village” of Menlo Park and its new Fire District. While Armistice was declared on November 11, 1918 — 100 years ago today — the activities at the Camp didn’t fully wind down until 1920. The creation of the hospital campus, returning war injured, TB, an influenza epidemic, and eventually World War II changed the community forever. The Fire District first struggled with being told by Southern Pacific Railroad to move its 1899 Carriage House, which housed its horse-drawn hose wagon, both of which still exist today. The District’s First Fire Station is among one of the communities 18 oldest buildings that were all constructed in the 1800’s. By November 1917, the Fire Commissioners were directly in communication with the War Department headquartered in San Francisco for the use of the Fire District’s new Fire Apparatus. On September 16, 1918 the Fire Commissioners worked with the County Board of Supervisors to pass a resolution that said “this Board does hearby find, ascertain and determine that the building and erection of permanent quarters for the housing of the equipment of said fire district is a matter of urgency and necessity”. This resolution was sent to the War Industries Board and State Counsel for Defense with a budget request for $10,000 dollars. 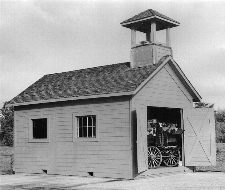 The new Fire Station was completed on May 17, 1919, at a cost of $9,128.00. It was located at 1077 Merrill Street and built on the former site of Menlo Park’s first business — Louis Golder’s two-story hotel and saloon called Menlo Park House that had been built in 1867. The building served as the community’s main fire station until the Fire District moved its headquarters to 300 Middlefield Road. The building was torn down in the 1980’s to make way for Menlo Center, the home of Kepler’s Book Store and Café Borrone.